DIY Bath Bombs: Make Your Own Rose Bath Bombs! Rose Bath Bombs are the most luxurious of bath bombs to make. 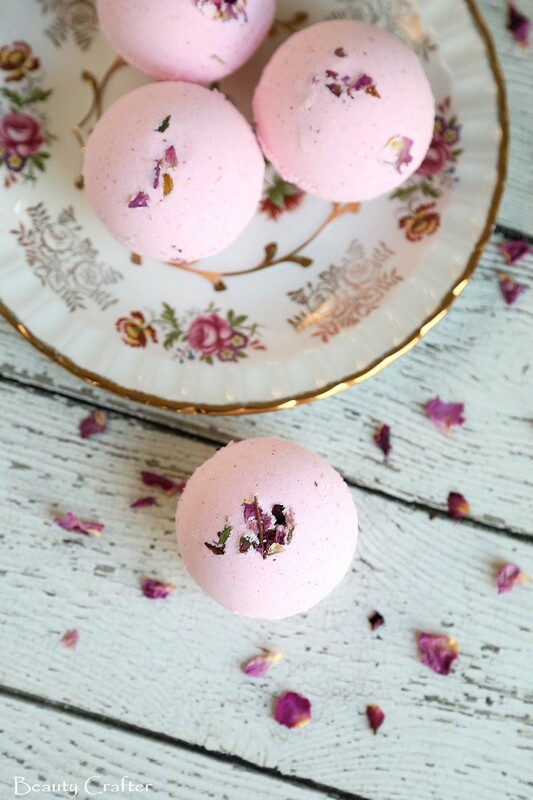 These DIY bath bombs feature rose absolute and rosehip oil for the most amazing fragrance and skin nourishing properties. Dried rose petals add an elegant touch. The bath bombs can make a romantic gift or a lovely DIY gift for someone who could simply use some pampering. There are so many reasons to love rose bath bombs. Since ancient times the fragrance of roses has been among the most coveted of scents and often associated with love and romance. The scent of the rose is as reported to have an uplifting effect on the spirit, relieving depression and anxiety. In addition to the scent related benefits, there are numerous other health benefits of adding various rose extracts to the bath via a bath bomb. Rose has often been used homeopathically to help regulate menses. As an antispasmodic, it may help with muscle cramps. It is said to help remove toxicity in the body. Anti-aging properties for the skin. Rose extractions may help fight infection of small scratches and such on the body, due to it’s antibacterial properties. 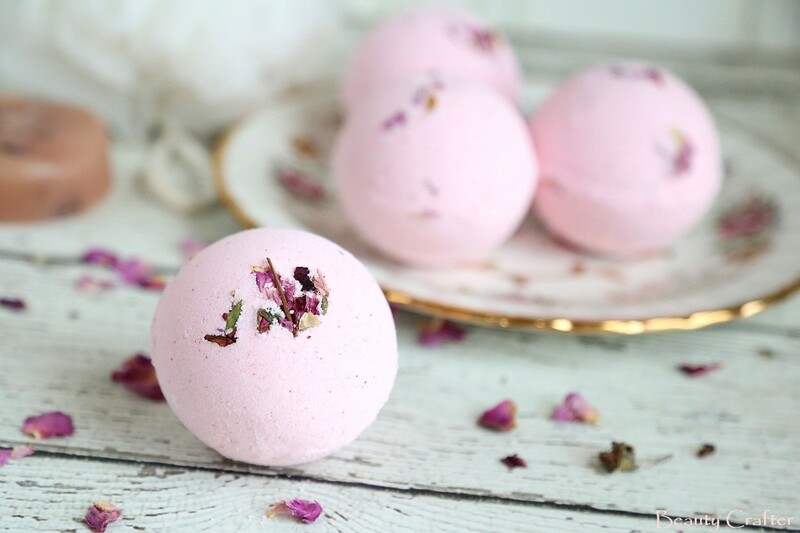 As rose essential oil is prohibitively expensive for many people, rose absolute is used to make these DIY bath bombs. Absolute is a little stronger in fragrance than rosewater by volume, most brands are in the range of 3-5% actual rose oil diluted in carrier oil. While rose otto is steam distilled from rose petals, absolute uses a solvent to extract the oil from the petals. The process is more effective, thus making absolute both slightly stronger in scent and less costly. This makes it a great choice for use in handcrafted bath products. DIY Bath Bombs – Grab Your Supplies! While making your own DIY bath bombs is actually pretty easy, it is helpful to keep a few tips in mind. Humidity can effect results. The reaction between the citric acid and baking soda is triggered by water. A particularly humid day can cause your bath bombs to blister rather than dry with a nice smooth surface. Work promptly when mixing and molding your bath fizzies. While humidity is a concern you are actually more likely to dry out your mixture. This makes and difficult to mold and bath bombs will crumble apart. Put the pressure on. Don’t be dainty about filling your molds, ensure they are fully packed and overflowing when you press them. Extra will fall away and the resulting bath bombs will be more sturdy to handle both when unmolding and when dry. 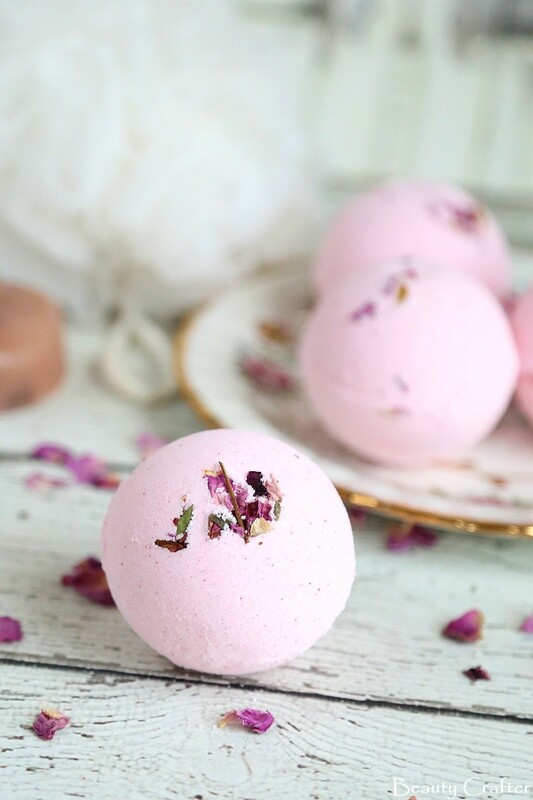 With wedding season coming up, these rose petal bath bombs are great to keep in mind. They would make lovely wedding favors. A fragrant bath bomb would also make a great bridesmaid gift. Of course, they are perfect for the bride and groom to enjoy on the honeymoon as well. Here is the easy DIY bath bomb recipe recipe to make these lovely fragrant and skin nourishing rose bath bombs. They make an amazing gift! Whisk together the dry ingredients: baking soda, citric acid and cornstarch. Add the rose absolute, rosehip oil and colorant. Mix these in very well. It may take a few minutes to ensure they are smoothly disbursed. Quickly whisk in 1/2 of the water. Test the bath bomb mixture by grasping a handful and checking to see if the mix holds together readily. You will probably need 1 tsp to reach the proper consistency, but humidity and other factors can effect this, so quality may need to be adjusted slightly. Whisk in more as needed. Drop a few dried rose petals on the bottom of each side of the bath bomb mold, then top with some of the mixture. Add a few more petals near edges as you fill the mold. Gently press down on each side, then overfill each side before pressing them together firmly to create each bath bomb. Gently remove from mold and brush away excess from the seam, then leave out to dry overnight before packaging. Store your rose bath bombs in a sealed jar or package in shrink wrap bags to retain the fragrance. I chose to skip Epsom salt and coconut oil in this particular bath bomb DIY. My focus was on creating a firm bath bomb with a strong focus on the beneficial properties of roses front and center. I found the rose hip oil and rose absolute provided plenty of oil for the recipe.